The U.S. Bureau of Labor Statistics reports about 21 states had decreases in unemployment rates, 17 states and the District of Columbia had increases, and 12 states had no change. Forty-six states and the District of Columbia had unemployment rate decreases from a year earlier and four states had increases. The BLS says the national jobless rate was unchanged from February at 6.7% but was 0.8 percentage points lower than one year ago. 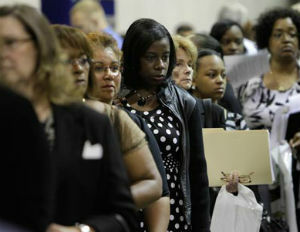 â—¾Overall, 24 states had unemployment rates significantly lower than the U.S. figure of 6.7%. Rhode Island had the highest unemployment rate among the states in March (8.7 percent). percentage point), Vermont (-0.3 point), and Indiana and Massachusetts (-0.2 point each). In March 2014, seven states had significantÂ increases inÂ employment. The largest job gains wereÂ in Florida (+22,900), North Carolina (+19,400), and Georgia (+14,600).